Agile combat support specialists that excel at hindering enemies and stealing their items. Rather than attacking enemies directly, the thief uses sneaky tactics to plant hate onto a secondary target through considerable burst damage. Steal 5 00:05:00 Instant Steal items from enemy. Sneak Attack 15 00:01:00 00:01:00 Deals critical damage when striking from behind. Flee 25 00:05:00 00:00:30 Increases movement speed. Trick Attack 30 00:01:00 00:01:00 Deals extra damage when striking from behind a party member. Mug 35 00:15:00 Instant Steal gil from enemy. Hide 45 00:05:00 Random User becomes invisible. Collaborator 65 00:01:00 Instant Steals one quarter of the target party member's enmity and redirects it to the thief. Accomplice 65 00:05:00 Instant Steals half of the target party member's enmity and redirects it to the thief. Assassin's Charge 75 (Merit) 00:15:00 00:01:00 Will triple your next attack. Feint 75 (Merit) 00:10:00 00:01:00 Your next attack will greatly reduce an enemy's evasion. Despoil 77 00:05:00 Instant Steals items from an enemy while inflicting a status ailment upon it. Conspirator 87 00:05:00 00:01:00 Enhances accuracy and Subtle Blow effect for party members within area of effect. Does not affect the party member being targeted by the enemy. Gilfinder 5 Enemies drop more gil for you. Evasion Bonus I 10 Increases your evasion ability. Treasure Hunter I 15 Mobs have a greater chance of dropping items. Resist Gravity I 20 Increases resistance against Gravity. Evasion Bonus II 30 Increases your evasion ability. Resist Gravity II 40 Increases resistance against Gravity. Treasure Hunter II 45 Mobs have a better chance of dropping items. Evasion Bonus III 50 Increases your evasion ability. Triple Attack 55 You have a chance of striking three times in a single attack. Assassin 60 Makes Trick Attack more effective when used on its own. Evasion Bonus IV 70 Increases your evasion ability. Ambush 75 (Merit) Grants an accuracy bonus to melee and ranged attack from behind an enemy. Aura Steal 75 (Merit) Adds a Dispel effect to Steal. Occasionally absorbs dispelled effect. Evasion Bonus V 76 Increases your evasion ability. Critical Attack Bonus I 78 Improves power of critical hits. Dual Wield I 83 Allows user to equip two weapons at once. Critical Attack Bonus II 84 Improves power of critical hits. Treasure Hunter III 90 Increases chance that treasure will be dropped by enemies. 1 Perfect Dodge 02:00:00 00:00:30 Allows you to dodge all melee attacks. Weaponskills are abilities that become available when a player has gained 100+ TP while damaging a mob with their weapon. All weapons, with the exception of Thrown and Instruments have their own set of weaponskills. Weaponskill availability is dependent on a player's skill level with the weapon as well as the weapon itself. Flee Recast Reduces recast timer by 10 seconds per upgrade. Hide Recast Reduces recast by 10 seconds per upgrade. Sneak Attack Recast Reduces recast by 2 seconds per upgrade. Trick Attack Recast Reduces recast by 2 seconds per upgrade. Triple Attack Rate Increases rate by 1% per upgrade. Assassin's Charge Turns your next attack into a triple attack. Additional upgrades to this ability lowers the recast timer by 2 minutes 30 seconds. Feint Inflicts Evasion Down on your target. Additional upgrades to this ability lowers the recast by 2 minutes. Aura Steal The Steal ability will dispel a buff from a friendly enemy sometimes contributing the buff to the Thief. Additional upgrades to this ability increases the chance to absorb buffs by 20%. 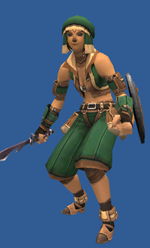 Ambush Gives a ranged and melee accuracy bonus when attacking from behind an enemy. Additional upgrades to this ability will increase the accuracy bonus by 3. This page last modified 2011-03-28 21:05:55.